Most well-known for his 'History of the English Church and People', the Venerable Bede (c. 672-735) wrote other best-sellers, many of them commentaries on the books of the Bible. His books were studied by theologians throughout the middle ages. Bede lived from boyhood until his death at the monastery of Jarrow, but his tomb is in Durham Cathedral. This manuscript of his commentary on the Book of Proverbs (of Solomon) belonged to the library there. 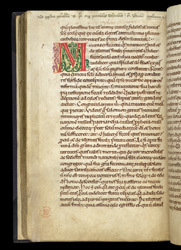 The large letter on this page begins the proverb of the 'valiant woman' (Proverbs 31:10). At the top of the page, a librarian has marked it with a title. Bede's commentary consists of a brief interpretation relating each sentence allegorically to the Christian Church.